We just received this review and are ecstatic to share it. Before I get back to the busyness of life, I wanted to take the opportunity to say how much we enjoyed working with Fort Mill Photography at Ellie & Scott’s wedding. Both you and Chris were professional, courteous, and extremely thorough, moving things along in a timely manner to make sure you had appropriate lighting for the shots you knew the kids wanted. 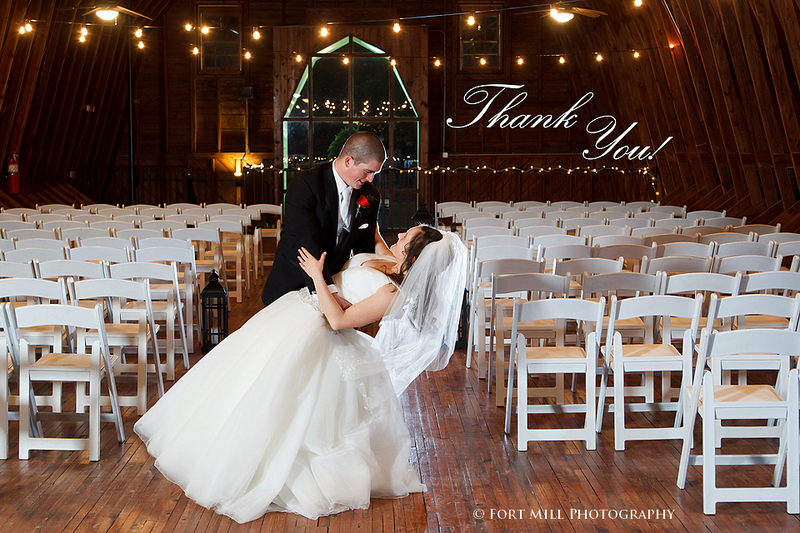 Having seen just a few of the proofs that you promised and expedited for our Thank You and New Year’s cards, I am confident we will be another Fort Mill Photography “extremely satisfied” customer! The few photos we have had the opportunity to view are absolutely gorgeous! We could not be more happy and satisfied with our choice to use Fort Mill Photography to capture our very special memory. I would highly recommend your services and it would be my privilege to serve as a reference in the future! So where does a young outdoorsy Colorado couple choose to have their Fall Wedding…well The Dairy Barn of course. Matt and Kelsey grew up in the Carolinas but were enjoying life together in Colorado after college. The proposal took place on a mountain top in Colorado but the wedding planning was going full steam ahead in the Carolinas. Once the Venue was decided upon, Kelsey’s Mom pulled together an amazing team of professionals to make this day extraordinary. The Rustic Elegance Theme was unfolding bit by bit with the help of longtime friend Heidi and one of our longtime favorite florists The Flower Diva. The photos will tell this story in vivid detail from the wedding details, the decor, their passionate first look, their vows and the joy of family and friends who support this couple 100% in everything that they do. Many thanks to all the talented vendors who helped bring this vision to life. There’s nothing like a Fall Wedding in the Carolinas. Brakefield at Riverwalk in Rock Hill South Carolina sets the tone for Susan and Cory’s beautiful late September Wedding. The golden tones of the afternoon sun and the goldenrod out on the nature trail make the backdrop for Susan and Cory’s couple session just breathtaking! Below are some of the talented vendors that made this day extra special. The term “Trash The Dress” sounds a little harsh doesn’t it? Especially after you’ve invested thousands of dollars in that dress. Well let’s put it into perspective or maybe I should say let me give you our perspective. You’ve bought this amazing wedding gown. You had bridal portraits done and worried the whole time about getting the dress dirty. They are GORGEOUS but they are not as free spirited as you may have wanted them to be. The Wedding Day has come and gone and the dress gets shoved back into the bag or shipped off to the cleaners for preservation. Why not have some fun with it before that preservation stage. Our former Bride Erica knew that she had another vision in mind for that dress. She’s an avid equestrian and horses have been a huge part of her life since she was a little girl. A “Trash The Dress” Session was exactly what Erica had in mind. It wasn’t that she wanted to ruin her dress, she just wanted to wear it, play in it, and not have to worry about getting anything on it. We suggested the ASC Greenway for a location for the shoot because of it’s horse friendly environment and many wonderful locations that fit the look and style of Erica’s vision. She brought her horse Kate from miles away by trailer, we spent 2 hours walking the ASC Greenway and photographing in many different locations and ending the session with a ride across the horizon in one of the prettiest sunsets we’ve seen all year. Now the dress will go to be cleaned and who knows what Erica’s next vision will be for that dress … maybe a christening gown?